This article comes to us from Unofficial Guide researcher Darcie Vance. Darcie has contributed to the Unofficial Guide for seven years. January marked the opening of the new Exotic Driving Experience at the Walt Disney World Speedway. I have to admit my love of fast and expensive cars comes from watching years of the UK show “Top Gear”. After booking my experience I jumped around my room yelling “Power,” and practiced other fun things to say that would make Jeremy Clarkson proud! However other Top Gear fans should note: no cars are harmed in the Exotic Driving Experience. The experience allows guests to drive some of the most expensive luxury cars on the market today. Drivers can choose from five different supercars: Ferrari 458 Italia ($389), Lamborghini Gallardo LP570-4 Superleggera ($339), Lamborghini Gallardo LP560-4 ($299), Audi R8 ($269), or Porsche 997 S ($199). Two laps inside one of the cars as a passenger can also be purchased for $99. Annual Pass holders and DVC members are currently eligible for discounts on the Richard Petty Driving Experience. The new track that these expensive machines go around is a combination of a straightaway and fast right and left hand turns. The course is designed to allow drivers to accelerate to high speeds and also test the cars braking and handling abilities. Each driver will be driving a total of six miles in the car. Keep this in mind before booking! 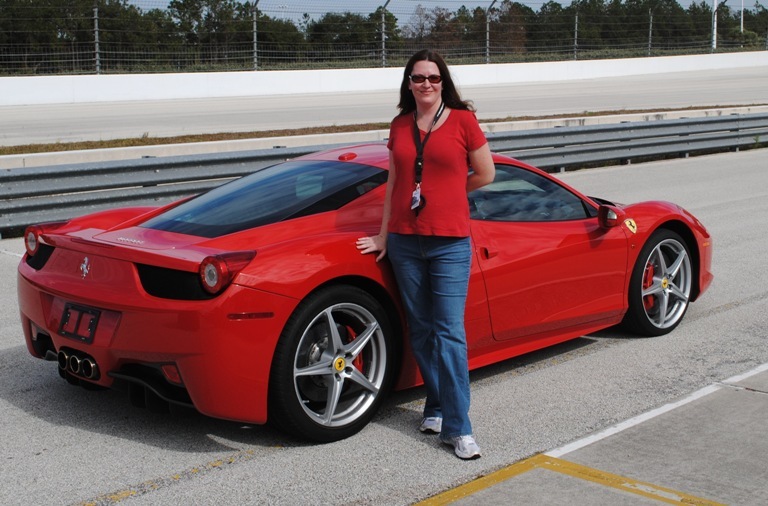 Personally six miles was not enough time to fully enjoy or get used to driving my Ferrari for the day. I was also surprised to learn that around 30 people are scheduled to drive the cars during the same reservation time. This means up to five people will be using the same car during your experience. There is no guarantee you will be the first to drive the car you picked. Each person will spend around 12 minutes in the car actually driving, so if you are in the first group of people to drive then your experience is over first without all the waiting around. For some reason I had delusions of grandeur thinking I would be the only one driving my car at the time of my appointment. Luckily I was the first in my Ferrari so I did not have to wait around before I could drive. Before you jump inside the car of your dreams you are shown a short video and given a few safety instructions. For those who do not know how to drive a stick shift do not worry! Each car shifts without a clutch and uses a gear shifter on the steering wheel, or as Jeremy would say “flappy panel gear box”. The car can also be turned into automatic mode and a driver can navigate without using the steering wheel shifter. I decided to drive in automatic so it was one less thing to worry about while putting the pedal to the metal. While driving there is no racing the other people or cars that are on the track. The experience makes you feel like you have the whole track to yourself. There are track officials who monitor the track and make sure each car is a safe distance away from each other. This is for the safety of the drivers as well as those beautiful cars. The hardest part of the course was when my instructor told me to veer off the course and go back to park the car! Once the 12 minutes of fun are over you are invited to see your ride video inside. This high tech ride video will show you the course, your driving video and a diagram of how fast you were going at all times. The video can be purchased for an extra $89 for a CD or $99 for a gig stick. The video is the only way for a driver to find out the exact speed and how fast they went around the track. The experience is just that, an experience with no proof of what you have done unless you are willing to buy the video or pictures. Also note that the pictures or video must be purchased within the two hours of your driving experience. All pictures and videos are deleted after each session is over. So make 100% sure you have bought everything you might want before you walk out the door, there is no changing your mind once things are deleted. When I brag to people and tell them I was able to drive a Ferrari they always ask, “Was it worth the price.” I always answer with a yes and a no. The car is something that I would never be able to afford to own so on that note it was cheaper to pay $389 to drive it for 12 minutes. However I felt I did not have enough time in the car. Because I was worried about how to handle all of the turns and curves on the track I was just getting used to the course and how to drive the car when it was over. If there were a few more laps involved and I got to spend at least 30 min in the car…I would say YES it was worth the money. I also did not like the fact that if you want to drive more than one car you must pay full rate for each car driven. I wish there was some discount available to those that are already paying hundreds of dollars for six miles of fun. The staff was top notch and very helpful. My driving instructor was calm and let me do all the driving without much interruption. They have a great set up going over there; I just wish it was either a longer experience, or a little less to pay. I also learned that The Walt Disney World speedway is open to the public and free to enter during business hours (which vary). Once inside you can ask questions or watch others enjoy their Exotic Experience. The speedway also allows each driver to bring spectators along free of charge. The spectators are allowed to take pictures and their own videos as their driver is going around the track. There is a special viewing area where spectators can watch the cars handle the hairpin turns. This is a great way to get free pictures and have someone to talk to if you have to wait for other people to drive your car first. Each driver must be 18 years of age and have a valid driver’s license to participate. For more information or to book an Experience visit ExoticDriving.com or call 1-855-822-0149. The speedway can answer questions but is not able to book driving experiences. Call 407-939-0130 for questions of when the racetrack is open for spectators. The Walt Disney World Speedway is located near the Polynesian Resort and the Ticket and Transportation Center. Follow the signs to the Magic Kingdom and let the theme park toll attendant know you are there for the Richard Petty Driving Experience to avoid the charge for Magic Kingdom parking. Signs will direct you to the speedway, which has its own designated parking. Participants should arrive at least 30 minutes before their scheduled experience. ← Visiting Disney During Busy Seasons: Crazy? CRAZY LIKE A FOX! If I did this (unlikely) I’d go with one of the exotic rental agencies in Orlando. Sure, there’s no track, but the tradeoff is a full day! I wish I could be given a chance to drive one hot car and test it at Walt Disney Driveway. Whew, that would complete my day.